Does your mobile workforce live in a world where information—and the ability to act on it—is spread across multiple devices? The Motorola ES400 is a cutting-edge mobile Enterprise Digital Assistant (EDA) that transforms mobile managers and task workers from informed to truly empowered by giving them the tools and access to critical enterprise-class applications they need to complete any job, anywhere. Instead of pushing information at your workers, give them what they need to take action when and where it matters – in front of your customers. 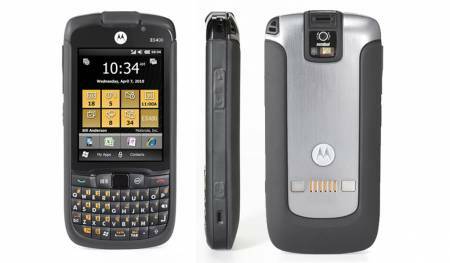 With the ES400, Motorola has in mind managers and workers who are on the go, in the field, in demanding roles, who can’t afford to wait to return to the office to make updates and who can’t afford to be precious about their phone either. The phone can withstand everyday knocks and is resistant to thermal shock, humidity, fog and rain. You can drop your ES400 onto concrete from a height up to 0.9 metres and the handset will survive. This toughness is combined with a strong practical core – the 3 inch resistive screen can accept signatures using the phone’s stylus; the inbuilt camera can act as a barcode scanner; and there is a fingerprint scanner for added security. The first thing to note is that the Motorola ES400S is not a phone for consumers. Indeed, Sprint and Motorola are pitching it as a mobile Enterprise Digital Assistant (EDA) for industry workers in field sales and service, retail, and health care. You can’t even buy the phone if you’re not purchasing it via a business account. So if you’re looking for the latest multimedia wonder, you should look elsewhere–the ES400S is all business and proud of it. Camera highlights With a resolution of 3.2 megapixels, this model will give you better pictures than other phones.